Honda has just taken the wraps off its latest naked bike in the CB650F and given you a faired version for good measure. Why have one when you can have two? It’s a pretty indulgent way of looking at life, and applies perfectly to the new Honda CB650F and CBR650F street bikes that are coming your way for 2018. Pick your poison. 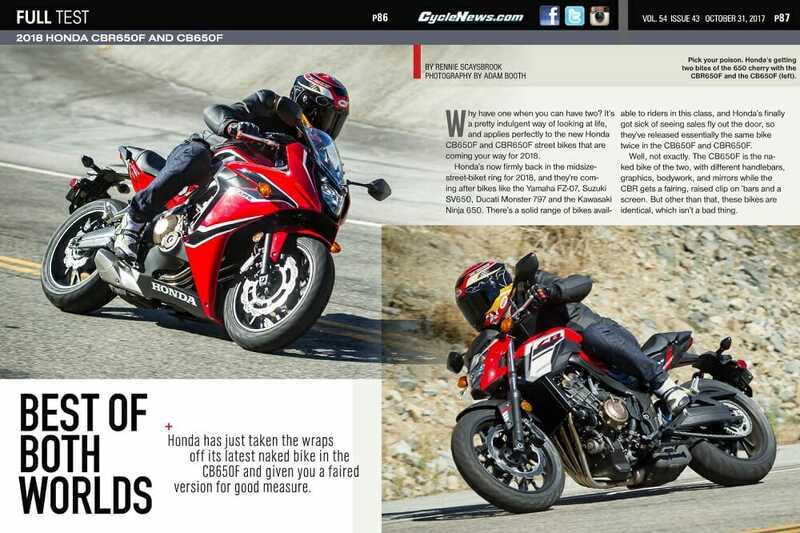 Honda’s getting two bites of the 650 cherry pie with the CBR650F (ABOVE) and the CB650F (BELOW). 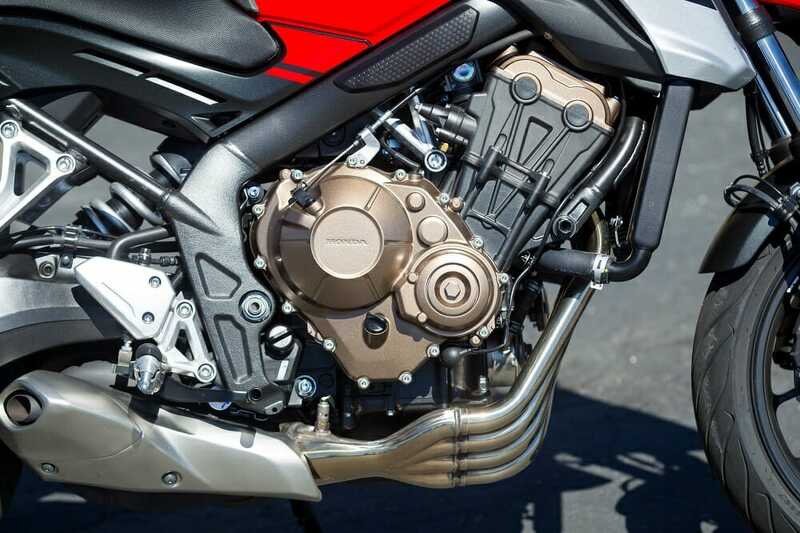 Honda’s now firmly back in the midsize street bike ring for 2018, and they’re coming after bikes like the Yamaha FZ-07, Suzuki SV650, Ducati Monster 797 and the Kawasaki Ninja 650. 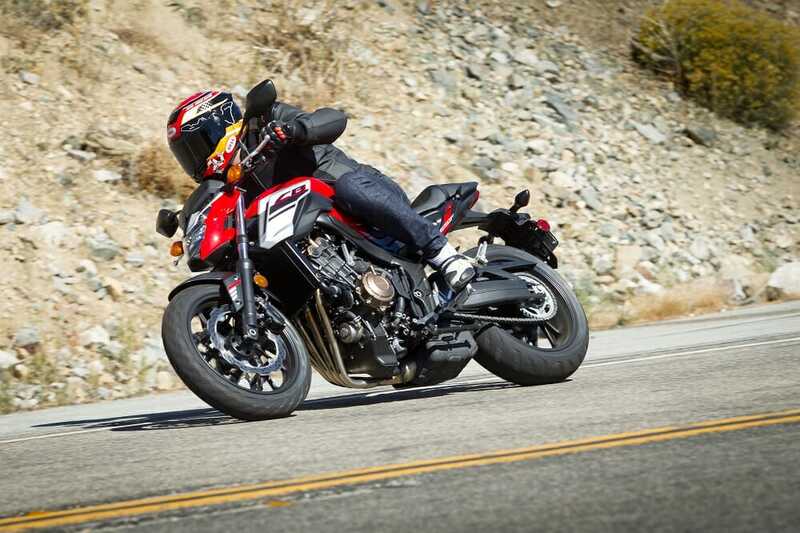 There’s a solid range of bikes available to riders in this class, and Honda’s finally got sick of seeing sales fly out the door, so they’ve released essentially the same bike twice in the CB650F and CBR650F. Well, not exactly. The CB650F is the naked bike of the two, with different handlebars, graphics, bodywork, and mirrors while the CBR gets a fairing, raised clip on ’bars and a screen. But other than that, these bikes are identical, which isn’t a bad thing. 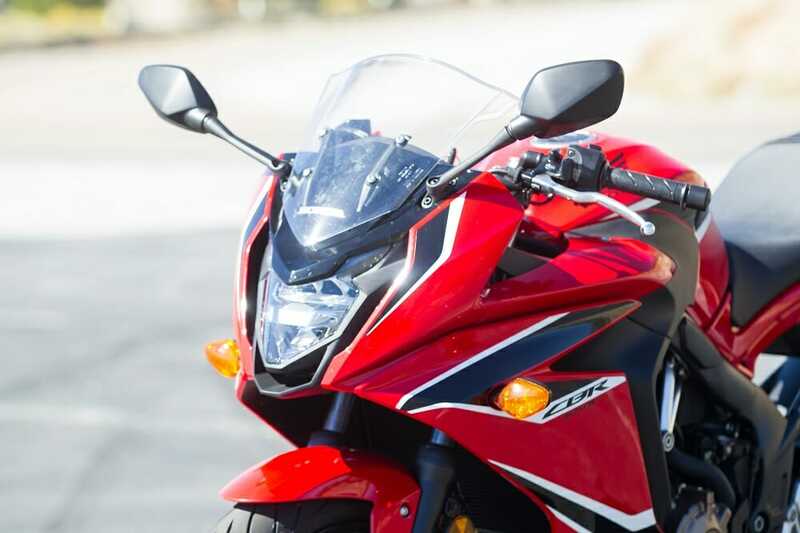 For those looking to get into sportbike riding, the CBR6560F is an unintimidating entry point. If you close your eyes and squint, you could be forgiven for thinking this is the original 1987 CBR600F come back from the dead. That bike gets legendary status for two reasons—the first being it invented what we now know as the Supersport class and second, that it introduced sportbike riding on a budget to a whole new generation of riders across the globe. This new CBR-F doesn’t have quite those same sporting ambitions, but it’s still capable of turning some quick canyon laps but doing it in a comfort level not really associated with a full-fairing 600. 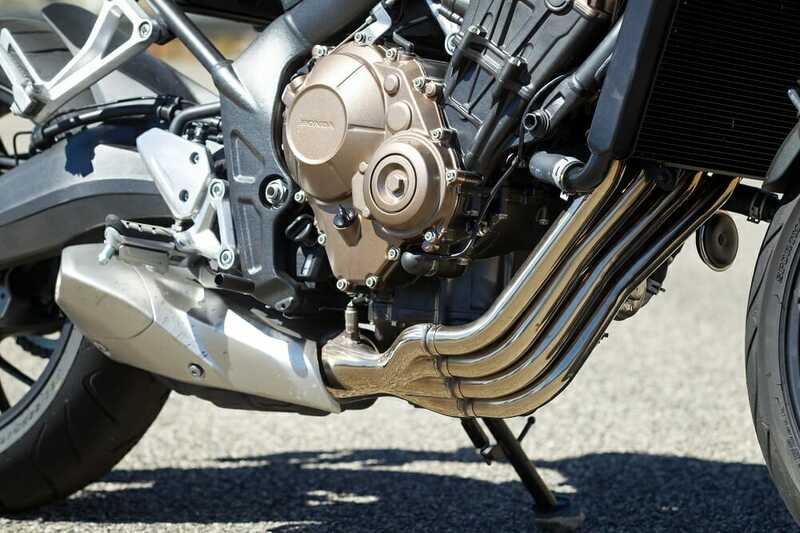 Underneath the skin of the CBR-F is Honda’s tried and tested 649cc inline four-cylinder. This is far from the kind of lump you’ll find in the smaller capacity, but much, much faster CBR600RR, a bike that feels like it’s got a good 40 horsepower on the 650 via my well-calibrated bum dyno (Honda won’t release details on just how much power it has). The CBR-F has its redline pegged at 11,500 rpm on a split left and right dash that is devoid of design imagination (Suzuki’s budget GSX250R dash is a far nicer thing to look at and access), and it’s a bike that needs to be revved to go anywhere yet feels rather under-stressed when you do so. Even though it revs to 11,500 rpm, this has to be one of the world’s most under-stressed engines. 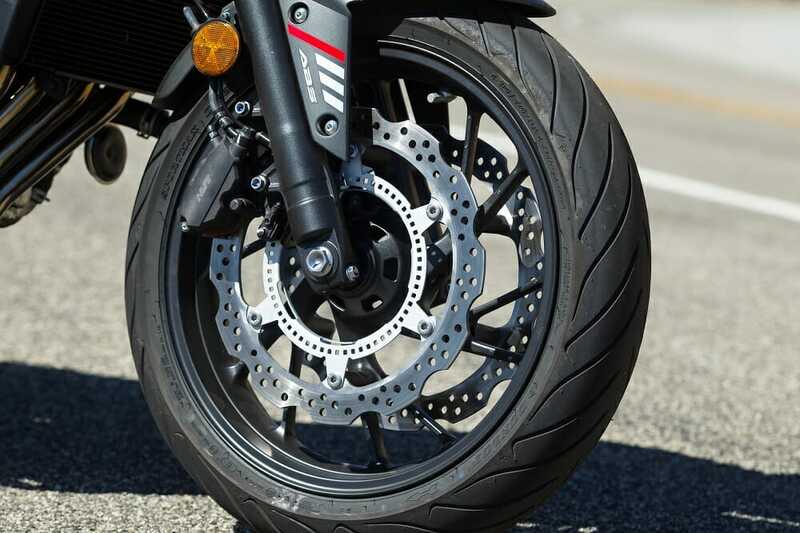 There’s decent power available from about 6000 rpm but anything below that is pretty elementary, unlike something like Yamaha’s FZ-07 that just wants to wheelie everywhere it goes. The CBR-F has a buttery smooth throttle response when the motor is spinning 3000 rpm or higher, something new and experienced riders alike are going to love as they dart up through the gearbox that house shorter ratios than the old CBR-F to keep you higher in the rev range and help you make the most of the power on tap, and there’s a nice little induction roar coming from the 650, nothing like the old CB1000R but still enough to give the CBR-F a bit of personality. LED head and taillights on the CBR (shown) and CB give them an edgy look at night. The CBR-F and CB come standard with Showa’s un-adjustable Dual Bending Valve fork that was released at the end of 2014. A budget priced item, Showa claims the Dual Bending Valve (surely, they could have come up with a better name than Bending Valve?) is claimed to offer similar performance to a cartridge-type fork but with a little less weight (around 250g per unit) and complexity in setting it up. The good news is this 41mm fork offers surprising performance ideally suited to the CBR-F and even more suited to the CB. It’s a plush ride but still performs well when pushed hard, and combines well with the preload-only adjustable shock and wide, long seat to give a comfortable ride over long distances. The CBR-F won’t nail bends as easily as its CBR600RR brother but it will perform admirably up to rather high speeds, as the suspension will reach its limitations quickly if you’re pushing exceptionally hard. Regardless, the ride is a smooth one and the Showa set-up will soak up most bumps you can throw at it. Nissin four-piston brakes are adequate for the task. Nissin provides the brakes and they are neither great nor bad. It’s a traditional master-cylinder set-up so it’s not like you’re going to get SBK levels of braking power, but it’s adequate for the job, especially when you throw in the ABS as standard. The CBR-F will be a strong challenger against something like the Kawasaki Ninja 650, although it’s almost $1000 more expensive at $8749. 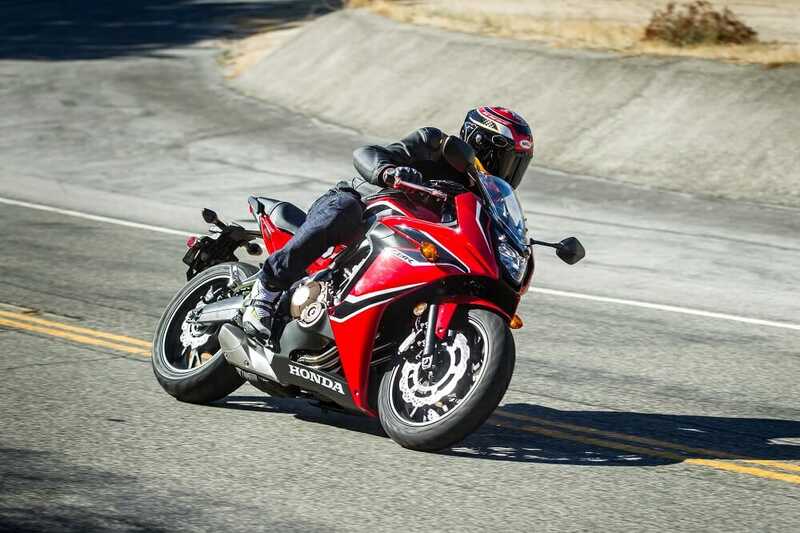 Still, the CBR-F should serve as a perfect introduction to sportbike riding for new riders, but it might have a tough time getting bums on seats in face of the competition from its twin brother. Yeah, the CB will do this sort of stuff even with an ABS system that you can’t switch off. If it came down to a pick of which bike I’d take, my vote would undoubtedly go to the naked bike CB650F. This kind of bike has been missing in Honda’s U.S. lineup for years. It’s been a wildly successful addition to the European Honda lineage since its release in 2014—successful because it’s kept to the K.I.S.S formula of a good engine, good chassis, comfortable ergonomics, and handsome looks. I’ve spent that last two weeks riding the CB around Southern California (I only had a morning on the CBR), and the more I ride it, the more I’m enjoying it. The CB has the comfort factor on its side over the CBR and that’s the winning card in my book. I also prefer the looks, which is interesting because if you think back 10 years ago, Honda wouldn’t be able to shift one CB for every 10 CBRs as everyone was still wrapped up in sportbike mania. Now it’s the other way around. How times change. Interestingly, for a naked bike you don’t get much of a wind blast as the dash cover has a nice little angle that helps deflect the oncoming air just enough that highway riding is not an issue. The single piece bar is perfectly positioned for a six-foot-tall rider and is rubber mounted and passes through hardly any vibrations (although the same can’t be said for the rubber-insert footpegs that will make your toes a touch tingly). Honda’s done a really nice job with the looks of the four-into-one exhaust. The gearbox is super smooth on the CB and CBR-F, and if you’re easy on the clutch as you release it you’ll notice the engine revs will rise a few hundred rpm to prevent stalling. As far as an everyday machine goes, the CB runs rings around the CBR-F. The lack of bodywork also shows off a rather nice looking engine, with Honda’s trademark side-swept exhaust and under-swingarm muffler on full display. 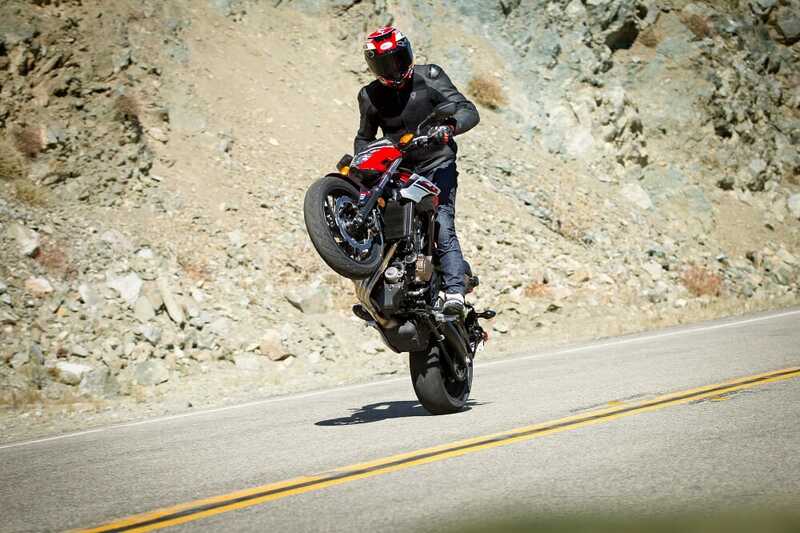 Click here for the latest Cycle News Standard motorcycle reviews and news. 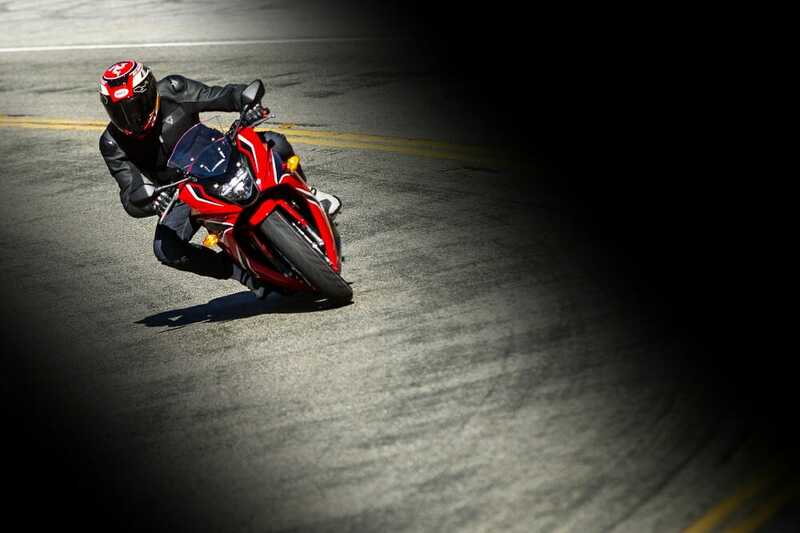 Click here for the latest Cycle News Sportbike motorcycle reviews and news.